Hey, Bostonites and visitors! Thinking about hitting the slopes this winter? Well, Boston's abundance of snow and its proximity to New Hampshire's White Mountains make it an ideal city for those who love winter sports. Boston's surrounding mom-and-pop ski areas offer mellow slopes for beginner skiers and snowboarders, as well as nighttime tubing fun. Venture a little further (within a two-hour drive) for a family weekend getaway or to enjoy a variety of terrain for all levels of skiers and riders. If you plan on being a weekend regular at a particular resort, purchase a season's pass. Most areas offer seasonal deals for individuals, students, and families, and young kids can usually ski for free. 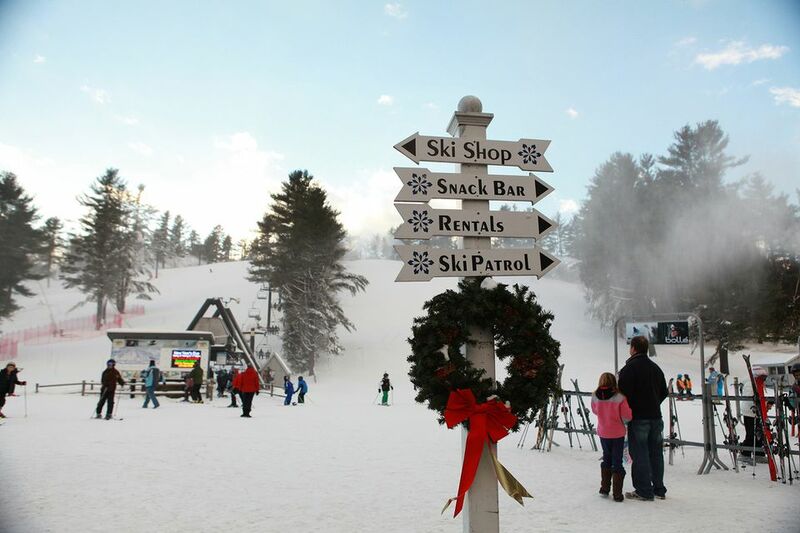 Blue Hills Ski Area—the closest downhill ski area to Boston—is just 17 miles away via I-93. You can even take the T—just hop on the commuter rail to the Route 128 station, then arrange for a Canton Town taxi or an Uber to pick you up and drop you back off at the end of the day. While Blue Hills Ski area only offers 12 trails and 309 vertical feet, the tickets are affordable and the learn-to-ski and ride programs make it a perfect hill for the kids. Located just outside Springfield, Massachusetts on the edge of the Berkshires (109 miles from Boston via the Mass Pike), Ski Blandford has welcomed New England skiers since 1936. In addition to 22 trails and 465 vertical feet, there are two terrain parks for both skiers and snowboarders to hone their skills. Ski Blandford also caters to young athletes, with their Tri-State ski racing program, where seasoned coaches prep all ability levels for local USSA races. Small and accessible, Ski Bradford is just under an hour's drive from Boston (40 miles away, via I-93 north). The mere 272 vertical feet might make you pass it up for a longer drive north, but with an uphill capacity of 9600 skiers per hour, Ski Bradford gives you the most local bang for your buck. This area also boasts a cutting-edge terrain park, complete with jumps, rails, and boxes, and a miniature halfpipe for little rippers. On weekends, take the Rails-to-Trails Ski Train to Wachusett Mountain and enjoy their whopping 1000 vertical feet and 26 trails (arguably, the biggest ski area in Massachusetts). The commuter rail runs to Fitchburg where the Wachusett Mountain shuttle will meet you. Make a weekend of it and enjoy a plethora of lodging and dining options in Fitchburg and Westminster, many of which offer ski packages to make the trip affordable. Situated in beautiful Franconia Notch State Park in the heart of New Hampshire's White Mountains (141 miles from Boston), Cannon Mountain challenges serious skiers. (For context, this mountain is home to Olympic Medalist Bode Miller). But don't let Canon's 2180 vertical feet and 25 miles of trails scare you. Their beginner terrain is also robust (check out the Tuckerbrook Family Area) and their lesson options and kid's programs aim to cultivate good skiers and snowboarders. Take a break from the slopes to visit the New England Ski Museum, also on site. Night owls—this ski resort for you! On weekend nights, from late December through February, Crotched turns on the lights so you can ski until 3:00 a.m. Leave work on a Friday night, arrive at the slopes (just 49 miles from Boston via I-93 north), and get your slide on. With 1000 vertical feet and 5 lifts—including a high-speed quad—Crotched claims you'll have "more fun per hour" at their mountain. Gunstock Mountain Resort, on the south shore of Lake Winnipesaukee, offers amazing views, 1400 vertical feet of skiing, and consistent lake-effect snow. College kids can blow off steam—while making skiing affordable—with Gunstock's college pass. Gunstock also has night skiing, winter zip lining, and the longest snow tube run in New Hampshire, making it fun for the whole family, even if you don't ski or snowboard. More than 60 groomed trails await skiers at Loon Mountain (a mere 130 miles from Boston). And they stand by their snow! If you're not satisfied with the snow conditions, take advantage of the resort's snow guarantee: just return your full-price lift ticket by 11:00 a.m. to receive a voucher for another day. Loon's inclusion in the new Icon Pass (a season's pass for 36 nationwide destinations) puts this hill on the map by grouping it in with world-class resorts like Jackson Hole, Wyoming and Steamboat Springs, Colorado. In the same "neck of the woods" as Loon resides Waterville Valley Resort‚ a one-stop shop for snow sports enthusiasts. Just 128 miles north of Boston, Waterville has some of the most consistent snowfall in New England. Enjoy downhill skiing, snowboarding, cross-country skiing, dog-sled excursions, snowshoeing, and more. You can even go for a pedal on a fat bike (winter mountain bike), taking advantage of over nine miles of dedicated winter biking trails and full- and half-day rentals. Hop the Saturday bus service from Boston to Pat's Peak, with scheduled pickups at the South Shore Mall, Commonwealth Avenue-Warren Towers, and the Ruggles T station. A trip to Pat's Peak makes the perfect Saturday getaway for Boston University students and the return trip home at 9:30 p.m. gives you a full day on the slopes. Groups of 15 or more can request a pickup anywhere in metro Boston (with at least 48 hours notice). And the mountain's 11 lifts and night skiing will assure a fun time for both skiers and snowboarders. Want to maximize your ski time? Just 104 miles from Boston, Ragged Mountain has two high-speed chairlifts (one quad and one six-pack), allowing you maximum runs on two peaks. Hop on the Spear Mountain Express lift and, in under 5 minutes, you'll be on top of a 1250-foot vertical drop and 250 skiable acres. Skiers and snowboarders can also enjoy Ragged's three terrain parks and a quick, healthy lunch at the Harvest Cafe. Mount Sunapee (101 miles north of Boston) claims to be "an extension of your family." And to families they are committed, with the offering of their Skiing Is Life! pass (a $39 lift pass) for both little kids and those over 80. With 1510 vertical feet, plenty of beginner terrain, and a host of winter and summer activities, Sunapee welcomes families with open arms. Which New England Ski Area Has the Best Views?